Our man in the field purchased this tape from a shop in Tangier. 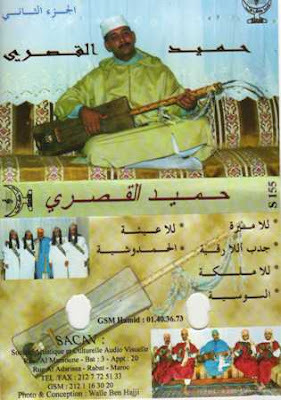 Having persuaded the two men working the shop that it was cassettes he was after not CDs he asked for "Gnawa" and was duly handed half a dozen tapes. Sometimes you do have to judge a book by its cover. Our agent reportedly "liked the look of these dudes". Part 4 of this cassette is one of the finest pieces of music CdM HQ has encountered from anywhere ever.